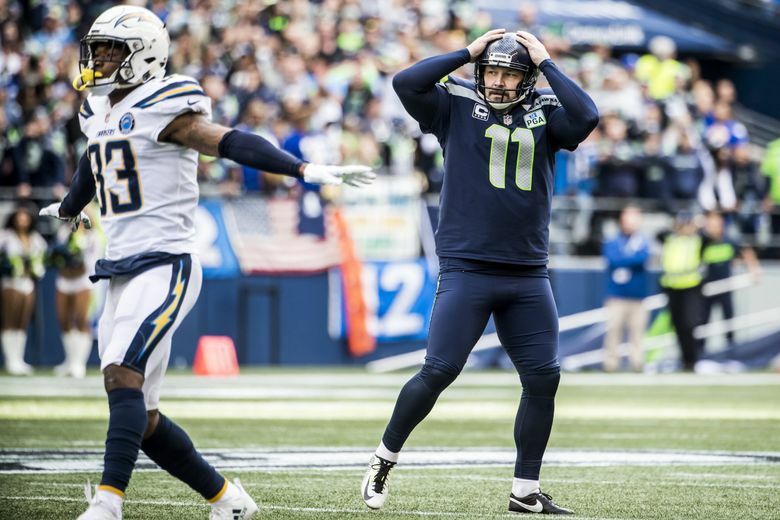 The day after a 25-17 defeat to the Chargers, Pete Carroll talked about the last play and others that got away from Seattle in a frustrating loss that dropped the Seahawks to 4-4. A game that came down to a final play to potentially force overtime was a far-too-fitting way to end the first half of the Seahawks’ season for coach Pete Carroll. Seattle ends the first half at 4-4, having won three games by 11 or more points but with all four defeats by eight or less. It won’t be easy to do that this Sunday as Seattle travels to play the 8-1 Rams, who are sure to be smarting from their first loss of the season Sunday at New Orleans and were listed as an early 10-point favorite — the biggest spread against the Seahawks since 2011. Carson did not play in the second half due to a lingering hip injury that had him listed as questionable heading into the game while McDougald sat out most of the second half with an equally lingering knee injury that also had him listed as questionable heading into the game. Carroll said he’s unsure of the status of either player for the Rams game, saying both were both pretty sore Monday and indicating both will likely practice little this week. Delano Hill would start for McDougald if necessary and Mike Davis would start in place of Carson if needed. Hill saw his most significant playing time of his career against the Chargers with 25 snaps after also taking almost all of the first-team reps in practice last week. Fluker left late with a calf injury but Carroll said he was OK on Monday. Carroll also said linebacker K.J. Wright, who was limited all week in practice as he continues to come back from knee surgery, made it through the game without any incident and should be able to play against the Rams. McKissic suffered a fractured foot in the preseason. Wilson was sacked four times Sunday and Carroll said Wilson could likely have prevented all of them. Wilson hadn’t been sacked more than twice in any of the last five games. Wilson also had a few uncommon misfires on some throws, notably on a deep pass down the middle to a wide open Jaron Brown. Seattle was flagged 10 times for 83 yards on a day when the Chargers were flagged 12 times for 105 yards. But a few of Seattle’s penalties came at really critical times, such as an offensive pass interference on David Moore on a pick play that negated a third-down conversion on a pass to Doug Baldwin to the 16 and instead made it third-and-13, with the Seahawks then forced to settle for a 51-yard field goal by Sebastian Janikowski that was no good in the second quarter when it was still a 12-7 game. Carroll didn’t question the call, noting that Moore put his shoulder into the defender as if to protect himself. Carroll said it will be a good lesson for Moore, a second-year receiver, on how to avoid such flags in the future. “He has to be stationary and be a receiver,” Carroll said. Also a killer was a false start on J.R. Sweezy that moved Seattle back from the 1 to the 6 prior to the final play. Sweezy moved after Charger defensive lineman Corey Liuget rocked in his stance a few times as if to mimic the snap. But Carroll said “he wasn’t in the neural zone’’ and that it would be “really hard for them to call it’’ on Liuget. The Chargers’ five biggest gains of the day — all of 23 yards or longer — all came in the first half, including a 28-yard run on an end around by Keenan Allen on Los Angeles’ first play and a 34-yard touchdown run by Melvin Gordon a little later. Carroll said the runs were all the result of Seattle defenders just not being in the right gaps. Carroll said the last play — a tipped pass that Moore just couldn’t quite bring in, letting the ball bounce off his chest — was an especially tough catch to make. The Seahawks made a change on their final kickoff return of the game, going back to Tyler Lockett in place of Penny. Lockett had a 34-yard return to the 36 that set up Seattle’s final touchdown. Penny has averaged 17.5 yards on eight returns with a long of 23 while Lockett is averaging 24 yards on nine attempts with a long of 42. Carroll said Penny needs to get better at timing up his catches of kicks so he is getting them on the dead run instead of settling under them and then beginning to run. The Seahawks touted Penny’s kickoff return ability when taking him in the first round last April — he returned seven for touchdowns while at San Diego State. Seahawks coach Pete Carroll reviews what went wrong against the Chargers Sunday.